Have you noticed that things are a bit quieter than usual in your MMO lately? Are the streets of Stormwind a little barren? Is the fleet not quite buzzing as much as it usually does? Is the crowd in Cyrodiil a bit thinner? If you’re finding that the online population is looking a bit smaller all of a sudden, you can probably place the blame on Mass Effect: Andromeda. Bioware’s juggernaut release has drawn the attention of almost everyone with any interest in RPGs, and one would expect plenty of MMO players to dive into it. I know I have. While playing Andromeda, I can’t help but compare it to MMORPGs here and there. They’re very different games in some ways, but very similar in others, and I think there are a lot of ideas MMO developers would be well-advised to steal from Andromeda. Most NPCs in MMORPGs are very forgettable. They send you off to collect seven and a half boar sphincters, you get some XP, and you move on, likely never seeing them again. Even in games where more effort is put into writing interesting NPCs — like The Secret World — you still eventually end up moving on. 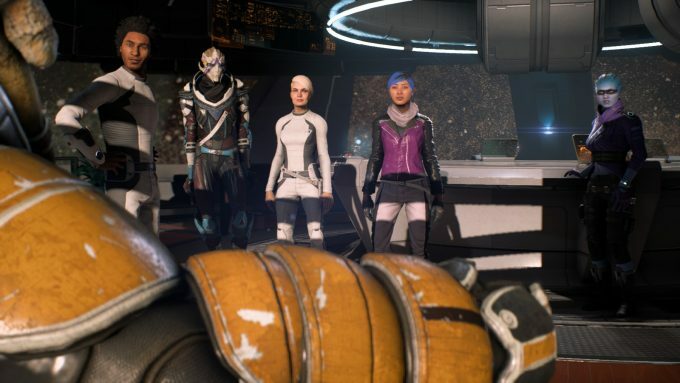 Mass Effect: Andromeda also has a lot of disposable NPCs that give you one side quest and are then forgotten, but like most Bioware games, it also features a core cast of companions who stick with the player through the entire game, growing and evolving along with you. Having a persistent cast to get to know and care about gives a significant emotional hook to a game. It gives you something to fight for, a motivation to keep going, and it adds an element of investment that can’t be achieved by simple game mechanics alone. I’ve long felt this is the way to go for MMORPGs, and I’m surprised more developers haven’t tried to buck the trend of disposable NPCs. Even Bioware’s MMO, Star Wars: The Old Republic, has struggled to maintain a consistent cast throughout its lifespan, though the more recent expansions seem to be making a greater effort in that regard. Only Defiance, of all games, has managed to maintain a consistent core cast from beginning to end, and I felt it gave the world and story a texture that most MMOs lack. One thing that I am greatly enjoying about Andromeda is that it has done away with traditional classes. Every ability in the game is available to the player. Spending skill points unlocks “profiles” that steer you toward specific playstyles, but even so there’s a tremendous potential for customization and playing the way you want, especially considering it’s easy to swap between different profiles and skill sets on the fly. And that’s without getting into the dizzying variety of guns and customizations for those guns that exist within Andromeda. Your options in this game feel almost limitless. I find this level of freedom incredibly liberating. I’ve never liked being tied to a narrow playstyle on one character. 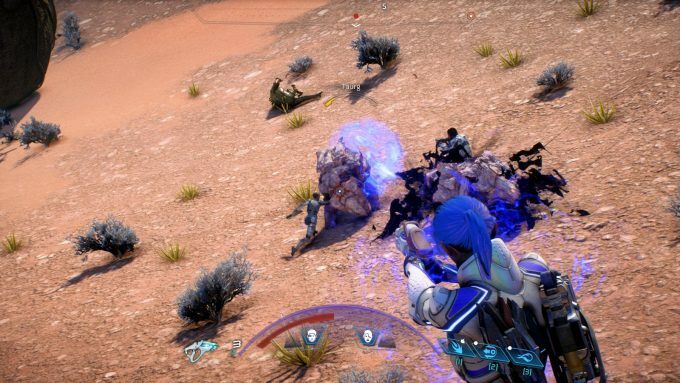 In Mass Effect, I enjoy playing as a biotic, but in the past games I always wished I could augment my character with some tech abilities or better combat skills without giving up my signature adept moves. In MMOs, I like playing a rogue in World of Warcraft, but I’ve always wished my rogue had an option for ranged fighting, since some fights are pretty harsh on melee. Andromeda has given me the freedom to break the mould that once confined me, and I would like to see MMOs follow suit. Now, the ability to customize your character without limit isn’t entirely unheard of in MMORPGs, but it is rare. 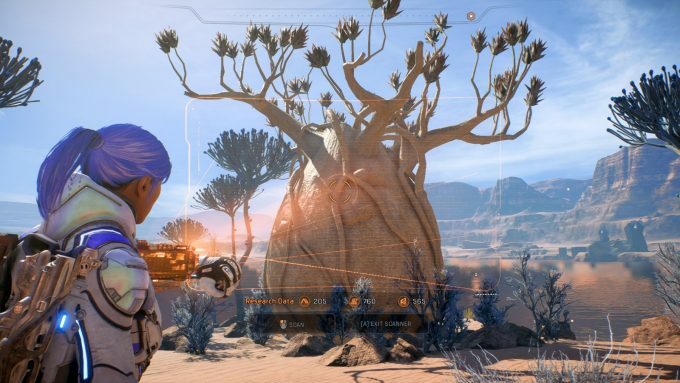 Only a few games — Rift, The Secret World, and to a slightly lesser extent Elder Scrolls Online — offer a level of freedom comparable to Andromeda’s. I would like to see this become a more common idea. Like a lot of MMOs — and really any games with large open worlds — Andromeda tends to entail a lot of travel time. Unlike MMOs, however, I’m not finding this feels like a chore in Andromeda. This is because movement itself is interesting gameplay. Andromeda equips players with powerful jump jets that allow them to leap and dodge with great speed and force, which makes navigating the often hostile terrain of the Heleus Cluster into a fun little mini-game all its own. This movement system even benefits combat. Players can leap into the air to fire over enemy cover or dodge circles around powerful mobs. When traveling longer distances, players can hop in the Nomad, an all-terrain vehicle. But whereas MMO mounts are usually just a passive speed boost, the Nomad has boosters for temporary bursts of speed and jump jets to help it clear obstacles, and the player can even toggle between different driving modes for better speed or climbing ability. Again, it makes simply getting around a lot more interesting. I’m not sure I’d want to see too much gameplay injected into movement in MMOs, as it could become over-complicated pretty fast, but it would be nice to see a bit more effort put into the mechanics of mounts and less into coming up with ever more bizarre visuals for them. Right now the only MMORPGs that seem to have put any real effort into making movement interesting are superhero titles like DC Universe Online and Champions Online. I don’t play those games much, but I’d take their travel powers over mounts any day. In most MMOs, you travel through the world in a very linear fashion. First this zone, then that zone. You could perhaps blame the genre’s obsession with vertical progression, but even in games with a more horizontal progression — like Guild Wars 2 — you still tend to go through the world in a pretty linear path. You can revisit old zones, but there’s usually not a lot of impetus to. My experience of Andromeda so far has been fairly different. It’s not just that enemies scale to your level, although they do, but that the game is designed to be approached in a non-linear fashion. I regularly find new missions and activities in old zones, and rather than following a strict path from one planet to another, I am instead finding myself going back and forth between various locations as dictated by the needs of the story. This feels a lot more natural, a lot more logical, than just going from one zone to another and forgetting about all that came before. It makes the setting of a game feel more like a real place. This is something MMOs would have to handle carefully, as being constantly sent all over the world could quickly become irritating. In the old days, this kind of design in MMOs was a lot more common, but it was often an exercise in frustration due to long travel times and non-scaling content that made revisiting older zones pointless. With more advanced technology and better design, I do think the concept of more non-linearity in MMO worlds could be made to work, and I would enjoy it if older zones could still have some meaningful content after you’ve moved on from them the first time. 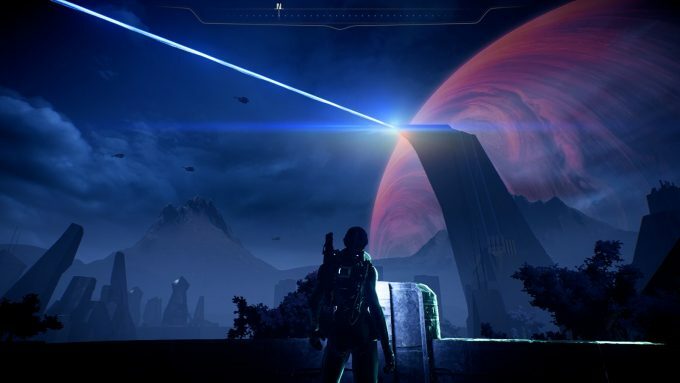 Have you been playing Andromeda? What lessons do you think MMOs could take from it? This entry was posted in General MMOs, MMO Game Design, MMO Opinions, Single Player Games and tagged Champions Online, DC Universe Online, Defiance, Elder Scrolls Online, Mass Effect, Mass Effect: Andromeda, Rift, Star Wars: The Old Republic, The Secret World, World of Warcraft on March 30, 2017 by Tyler Bro.